Julie's show business ambitions grew while she was still Vivien at Stainbeck Secondary School in Leeds where she spent her teenage years. She had learned to tap dance and sing while still in her childhood and always shone during opportunities to perform while at school. Upon leaving school she began to enter talent contests with the objective of becoming a professional singer. Julie even managed to win a contest in which one of her rivals was a very young Helen Shapiro. She apparently took her stage name from her accountant, Julian Grant, when she began dancing professionally. Although Julie recorded a respectable number of singles, this EP (Pye NEP24171) is her only original output, that I've so far found, to be contained within a picture sleeve. This disc contains four of the 'A' sides from her first five single releases. It is probably now easier to find these singles than this EP. 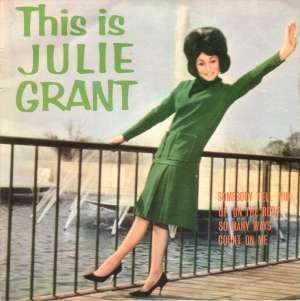 Julie Grant's perseverance brought sufficient notice to gain her TV work and a recording contract with Pye was then forthcoming. At Pye she became one of the first singers to benefit from the skills of their young A&R wizard Tony Hatch who had recently returned there after completing his National Service. Julie's first three releases failed to chart. She did much better with "Up On The Roof" which suited her powerful young voice admirably, but this almost certainly suffered from too much competition from the popular Kenny Lynch whose version hit the market earlier. Her next song "Count On Me" did better, but even this stalled just outside the top twenty. Despite one further minor chart success Julie never quite managed to consolidate herself as a major recording star and the flow of singles stopped at the end of 1965. Julie has lived and worked in the USA since 1967 and carried on performing until well into the 1990s. She has now retired from foreground popular music, but she and her husband run an entertainment agency which has many 1960s stars from the UK on its books. In November 2004 there was also a major re-release of her best recordings on CD:- Julie Grant - Come To Me : The Pye Anthology (30 tracks) on Castle 1051. You can find it on Amazon or simply order it from your local music dealer if you prefer.